In five short days, I’ll board a plane a head to Dallas for the 2017 American Christian Fiction Writers Conference. As I polish my pitch and print materials, I’ve been reflecting on my experience at last year’s conference in Nashville. Throughout that weekend, I was a sponge, noting various tips and tricks on the pages of my notebook. Aside from the writing wisdom I gained, I noticed three common themes in the other lessons I learned during my time away from home. 1. Get Connected. Volunteer. Those who know me understand I value service to others. When a friend suggested I consider volunteering for a couple of hours at the conference, I jumped at the chance. I signed up as to work at Registration, which gave me a chance to interact and connect with other volunteers and attendees before the event even started. And it was fun! I will work at Registration again this year. Be Intentional. The publishing world is about relationships, and networking is important. Business cards are a great way to get your name and face out there. However, I suggest exchanging cards with people after having a conversation. After parting ways with someone, I jotted little notes on the back of the card so I could remember our interaction in the future. While this may seem like common sense, I wanted to mention it because I recall two different occasions when I gathered with a group of writers during the conference, and someone suggested exchanging cards. Everyone shuffled their cards around the circle like we were getting ready to play Hearts. When I returned to my hotel room, I tried to remember something about them, and I couldn’t because there was no interaction to remember. Business cards are not baseball cards – don’t collect them for the fun of it. Remember not every interaction will be positive, and that’s okay. I’m an extrovert, and I’m not afraid to start a conversation with a stranger. There have been times when I’ve had to remind myself that not everyone is wired like me. For instance, one morning at breakfast in Nashville, I asked the man beside me a couple of questions: Where are you from? What do you write? Easy questions. He answered with one word, took two bites of his sausage, rose from the table, and left the room. This upset me, but I thought maybe he was going to have explosive diarrhea. It happens. I forgot about him and his odd behavior until I ended up alone with him in the elevator later that same day. In my friendliest voice, I reminded him that we sat next to each other at breakfast. He said “Yep” and exited the elevator as soon as the doors opened. At this point I was mad, and after venting to my roommate, she told me not to take it personally. And it’s true. How many times have I preached the same words to my daughters? As I initiate conversations this year, I will try to be more mindful and not expect to have a connection with everyone I meet. 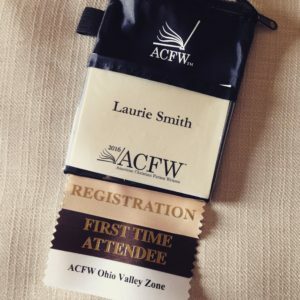 In preparation for agent appointments last year, I scrolled through the ACFW Conference links and noted what each professional required for the meeting. I had a copy of character lists, the first 10 pages of my book, the first three chapters, and the full manuscript. I had also created a one sheet for the pitch. I attended Agent Panels and learned what to do and what not to do. During my meetings, the agents didn’t wish to see any of the copies I had made. They preferred to talk about the book, but they did look at the one sheet when I offered it. I have created one sheets for the projects I am prepared to pitch next week.I also researched the agents and their agencies by reading their bios on the ACFW and individual agency websites. I scrolled through their websites and checked out their social media profiles. I knew they would assess whether or not I’d be a good match for their team, and I wanted to know if they might be a good match for me. I’m doing the same this year as I prepare to meet with editors. There were around 600 people attending last year’s conference, yet I kept passing the same faces in the crowd. There was one individual in particular, and I was prompted to introduce myself to him. During our conversation, I learned his flight home had been changed, and he had no ride and limited funds. Turns out he was from the same city as a woman I’d spent time with earlier in the day. I was able to connect them, and she was able to help get him find a way home from the airport. Every time I entered the large ballroom, I’d pray God would go before me. I’d arrive early and choose a seat at an empty table. I was surprised how He surrounded me with the right people. Give it a try, and if you don’t think that’s the case, maybe you’re the right person for person seated beside you. Check out this blog post to learn how God’s hands were at work, crossing Serena Crompton’s path with mine.